Help us raise money for the drought hit villages. The situation in Beed district in Marathawada is heart-rending. The helplessness of the people in the face of this fourth drought in the past 6 years is tragic. The priority right now is to reach water to the thirsty villages. Fulora Foundation intends to work in a 360 degree manner for the next three years to ensure that a focused area of a cluster of Villages in Beed becomes a model area, that can be replicated. Water conservation, water management, crop patterns, crop selection, direct-to-consumer marketing, schools, vocational institute, public health centers and training centers will be utilized to increase per capita income of the villagers from Rs 600 to Rs 1500 over three years. 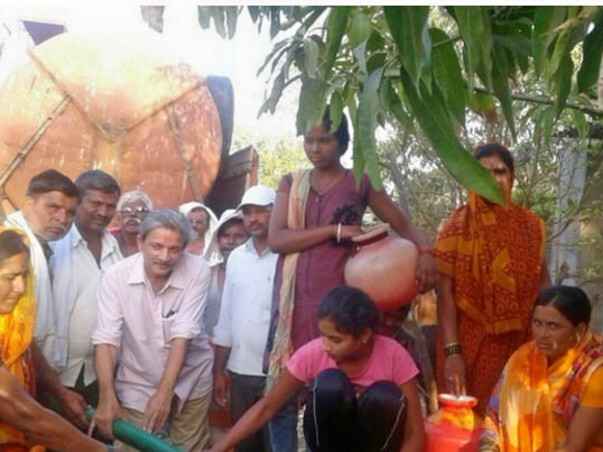 But right now, there are thousands of thirsty villagers whom we should deliver free water through water tankers. Above is the matrix of donations needed. Every square is for a tanker per village per day. The average cost of one tanker is Rs 2000. We have received some donations and we have been supplying water to around 33 villages of a total population of around 45000 people. 1. To continue to give water tankers to existing list of around 34 villages till June end (Each tanker costs around Rs 2000 and supplies around 10000 liters of water). 2. To increase tanker supply to more villages. (There are hundreds of villages that need water). After the monsoon starts and the need for tankers end, we will put up an audited financial statement for the tanker supply and put up the plan for permanent and sustainable solutions. Daily reports will be visible on the website. Please donate liberally in multiples of 2000, so that we can meet the above targets to reach maximum villagers. This year, sighting the adverse drought situation in the Beed district, Fulora has made a resolution to take up developmental efforts in multiple villages. Parli region has been selected as an ideal model, which can act as a reference point to those intending to undertake similar initiatives. Our team monitor’s the delivery of water tankers through its local activists, to supply water to these parched lands and try to reach out to as many villages as possible. Through our local activists, social workers and local administration, we have created a detailed plan for the deprived villages, along with the population census. This is only a temporary solution to the issue, but we intend at establishing sustainable models in the said region, to permanently curb such situations from arising in the future. We will soon commence primary activities such as: participate in the current water supply initiatives of the administration to provide water at least till the beginning of the monsoon, recharge the wells and boer-wells of every village to avert such future incidents, rain waterharvesting, build canals and dams on rivers, repair existing lakes, etc. Our goal is to change the economy of this tehsil by managing water and other resources, as well as growing new crops, direct marketing of crops and doing value addition by having agricultural produce factories and cold storage. This can only happen when all stakeholders and technology come together with someone driving it all the way through. We are continuously striving to achieve higher and higher targets with massive support from various organizations, institutes and varied sources that can assist our undertaking in an effective manner. Fulora foundation has 80G certification for tax exemption, all donors based in India get the 80G certification from this NGO. Fulora foundation has FCRA certification as well so contributors based abroad can also show their support towards this campaign and it's cause by contributing.